With the use of BASF’s particle foam E-por, Yamaha Motor WaveRunners fulfill the requirements on lightweight and buoyancy according to ISO 13590, the German materials company said. E-por is installed in the front and side spaces of the body of the VX700S model by the Yamaha where it ensures the buoyancy of the personal water craft (PWC) due to its low density. According to BASF, E-por is well suited as a flotage structure, due to its low density and good property profile. 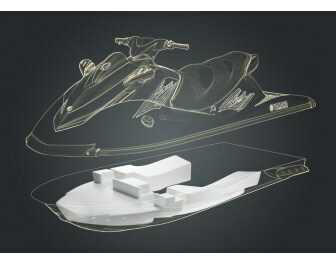 The VX700S at a vessel’s body weight of 240kg is said to be the lightest three-seater PWC model ever built. Despite making up a large proportion of the total volume, the E-por parts account for only 3.3kg of the total weight. BASF adds that E-por can be easily processed like expanded polystyrene (EPS) into the desired density and shape, so that the molded parts can be inserted optimally into the casing. E-por is an expandable interpolymer, based on a complex formulation of different polymers which interact with each other as well as with the blowing agent. It is a crack-resistant particle foam that is resistant to solvents too. This tough-elastic foam can also be stored, processed, and recycled like Styropor, notes the material company.